Rogaining is the sport of long distance cross-country navigation, in which teams of two to five people visit as many checkpoints (“controls”) as possible within a set time period. The checkpoints are marked on a map given to competitors shortly before the start. Checkpoints have different point values, and can be visited in any order, so strategy and route selection are key elements to achieving the highest point score. Teamwork, endurance, competition and an appreciation for the natural environment are features of the sport. Traditional and championship rogaines are 24 hours in duration, but shorter rogaines are common. Learn more about rogaining. Rogaine Israel 2014 is offering 5-hour and 8-hour events for those on foot, and a 6-hour event for mountain bike riders. Rogaine Israel 2014 will take place in Ramot Menashe, the Menashe Plateau. Situated south of Mt. Carmel, it is one of the most beautiful regions in Israel. The area is a unique combination of natural Tabor oak woodlands and planted conifer forests, open spaces, fields and orchards, springs and streams. The gentle slopes and rural character of the region create a pastoral, tranquil atmosphere. The region has a wealth of historic and archaeological remains from prehistoric times through the Ottoman Period, as well as extensive heritage related to the settlement and establishment of the modern State of Israel. Learn more about the Ramot Menashe area. Age is determined by the competitor’s age on January 1, 2014. The event center will be located near the center of the competition map. The exact location of the assembly area will be announcement just prior to the event. Directional signs to the assembly area will be posted on Route 6953. See map below. Every competitor will receive a map prepared especially for the event; it has a scale of 1:25,000. Each checkpoint has a numeric code, which is also its point value, from 31 to 90. This number appears on the map and on the checkpoint itself. Each checkpoint in the field is also marked by yellow flagging tape labeled with the checkpoint number and “Rogaine 2014”. Typically the yellow tape will be visible from a distance while the checkpoint control flag will be slightly hidden (behind a bush or tree) to reduce the chance of theft. The rules for the event are based on the international rogaining rules. In case of discrepancies between those rules and those defined by the organizers of Israel Rogaine 2014, the rules for this event will be the operative ones. 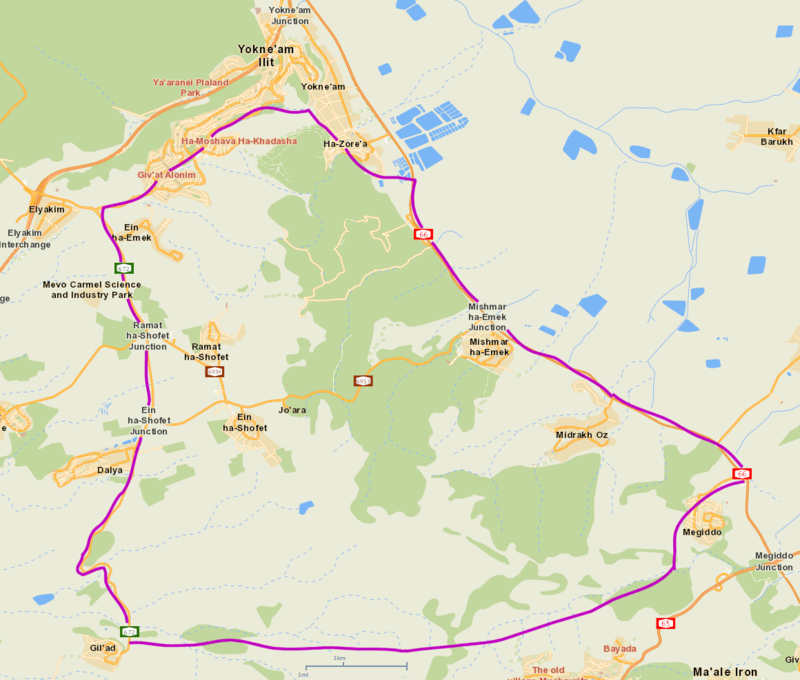 The rogaine map spans the forests of Ramot Menashe, between the city of Yokneam and Kibbutz Gilad, and covers an area of about 65 square kilometers. The terrain is partially forested and mountainous with an extensive network of trails, and partially agricultural land with both cultivated and grazing fields, orchards, and several rural villages. Directional signs will be posted on Route 6953 between Mishmar Ha’emek and Ein Hashofet. Registration ends 22 March 2014 at 23:59.